I've been curious about these MRE sammiches since they hit the market. 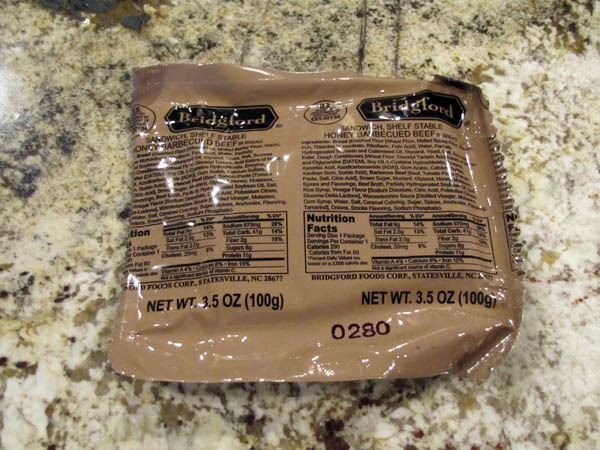 They are used in the military's First Strike Ration, which is kind of a more compact, eat-on-the-move version of the classic MRE that we all know. Their value proposition is simple -- a shelf stable sandwich that can be eaten without heating. I found 'em for sale locally at $14.99 for a box of four. It's a steep price - $3.75 per sandwich. They're $3.99 on Amazon, and I haven't seen them for substantially less. I'll get into that issue later. I've since eaten two of the sandwiches -- one during a camping trip, the other in preparation for writing this review. 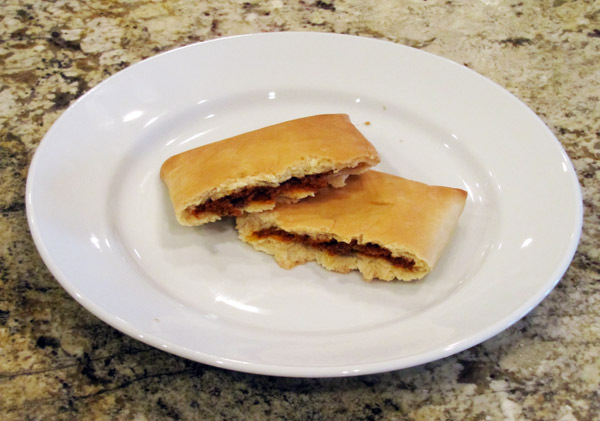 Overall, the BBQ Beef sandwich is pretty bland. The bread is bread-like but dry and artificial, and it turns into a sticky/doughy but still dry when you eat it. Lots of water is required. The BBQ Beef isn't nearly flavorful or present enough quantities to override the bland/not particularly good "bread." The BBQ Beef is dry, too--one step up from beef jerky texture-wise--which further increases the need for large quantities of water to wash it down. The overall experience is a bland, dry and artificial taste. BBQ Beef is definitely a loser in the taste department. Not flat-out disgusting, but not anything good, either. I've tried 'em both cold and hot, and hot is definitely preferable. If it's eaten cold, that experience is only accentuated--it seems to get drier and blander. Warmed up, the sandwich is a bit better--less dry--but not by a lot. If the Bridgford sandwich had other outstanding qualities, the crap-tacular taste could be forgiven. However, they aren't amazing in other areas, either. Stated shelf life is only 3 years, which is comparable to many off-the-shelf protein bars and canned foods--the Bridgford sandwich will last longer, but you will want to eat the other stuff sooner. They're also overpriced. $3.75 or more, per sandwich, is a rip off. At half that price, they'd be more compelling. For a couple more bucks, you get can put together a DIY MRE or get into Mountain House meals. You can get protein bars for much less. 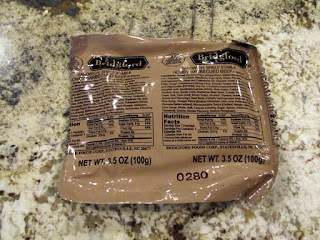 Heck, if you shop around you can find full MREs for less that what two Bridgford sandwiches cost. Yes, they're different use scenarios with the Mountain House, MREs and read to eat sandwiches (sandwiches are eat on the move, MH/MREs are more eat at camp), but they are competing "survival foods." Nutritionally, comparing to a Met-Rx protein bar of similar weight (3.5 oz), the protein bar has more calories (410 vs 290), more fat (14g vs 9g), same carbs (41g for both) and more protein (32g vs 11g). The protein bar also wins in terms of flavor. The Bridgford does have less sugar (8g vs 26g) and a longer stated shelf life (3 yrs vs about 2 years)--though both should be edible beyond those stated dates. Now my review is specific only to the BBQ Beef flavor--if there is another flavor out there that's substantially better tasting, then we may have a slightly different story. But, as-is, I only see these as having a niche use--mostly for when you are sick of eating alternatives or want something with less sugar.